This is one of the most fun-to-fly plane I have ever built (as of Spring 2002)! The A.D.V.E.R.S.E., which is even more fun, is a derivative of this plane designed for vertical takeoff right from the start. 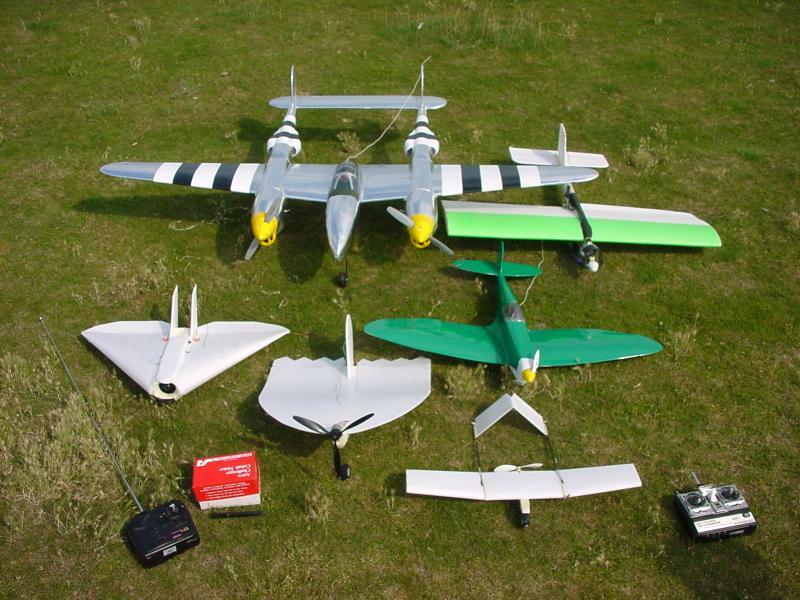 Prop: GWS 10x4.7 (310g static thrust @ 4.4 Amps) or GWS 11x4.7 (330g static thrust @ 4.9 Amps). Autonomy: the motor pumps about 4.4 Amps at full throttle (static). In practice, flights last 15 to 20 minutes. 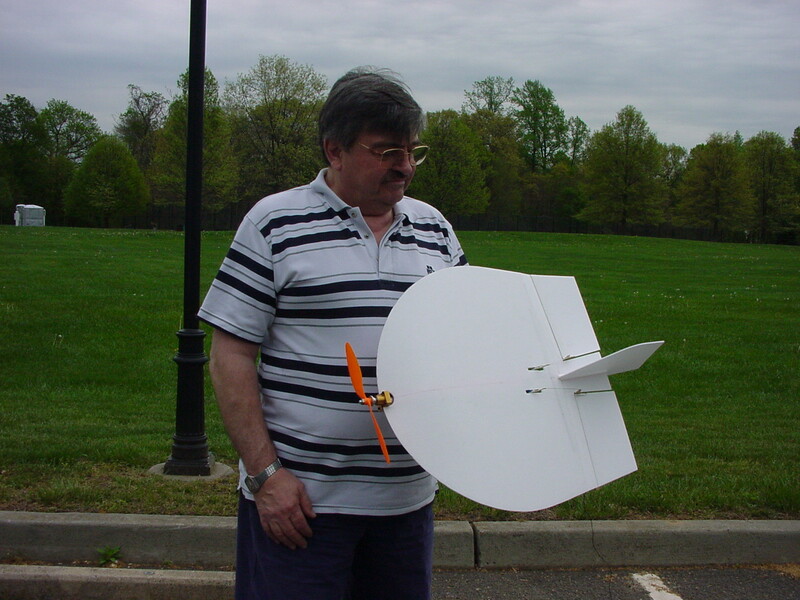 This thing has a larger-than-one thrust to weight ratio: the total weight is 290g and the static thrust is around 310g (330g with a 11x4.7 prop instead of a 10x4.7). This means that it can climb vertically, and can even hover, hanging by its prop, in a semi-controlable fashion if you are a skilled pilot! It's pretty much a scaled down version of the standard Drenalyn (504mm diameter instead of 610mm for the original Drenalyn, see links to Philippe Jambon's blueprints above). 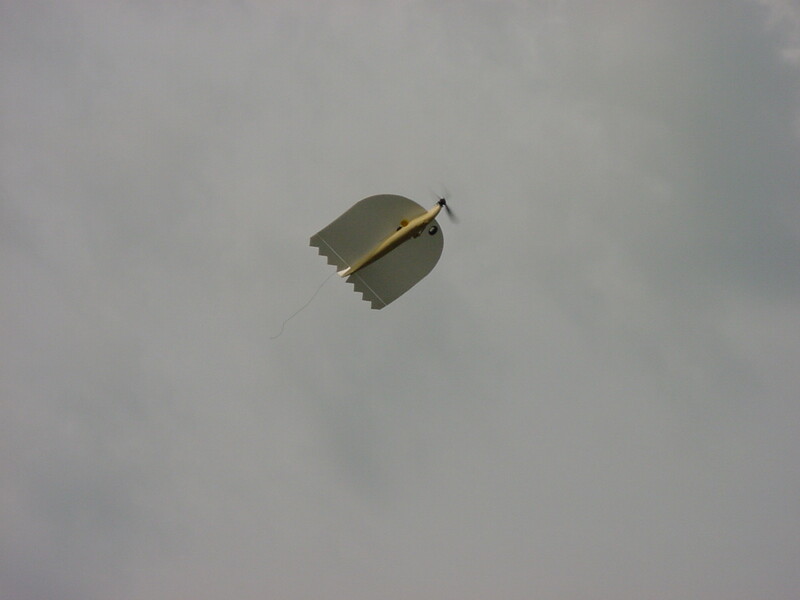 The wing is a single 3mm Depron sheet with a single carbon rod stiffener near the back. The carbon rod also serves to hold to thin music wire skids. The fuse is a chunk of pink foam (like the one you find in the US at Home Depot for insulation). The battery also comes from Home Depot: it is made from eight 700 mAh NiMh cells sold at Home Depot. For our Depron-starved American friends, I suppose the wing could also be build from Zepron, but it may have to be stiffened with another rod near the center of gravity. Here is the Drenalyn 504 held by Jean-Claude (Yann's dad). It has a single wheel and two music wire skids in the back. The 8-cell 700mAh battery pack is arranged as a long, flat 2x4 pack held by rubberbands. The center of gravity is right in between the two carbon tubes that hold the rubberband (near the on-off switch). This beast has amazing flight characteristics. The range of possible flight speeds is nothing short of hallucinating. You can fly quite fast in horizontal flight, and slowly transition to hovering flight with the plane hanging vertically by the prop. Dosing the power in this flight configuration is the trickiest part, but with enough practice, you can hover for minutes at a time. The best part is, if you get in trouble, just apply full power, push up the elevator stick a little, and the thing just climbs vertically. If you don't push up on the stick, you will experience the most common failure mode: a back flip. Even if you happen to do a back flip at low altitude, the structural damage will be non-existent to minimal (but remember to bring spare props to the field!). And now for something completely different. This micro Drenalyn is a gentle-flying indoor animal. It is built from 2 thin carbon rods and one carbon tube, with little pieces of Depron and a light iron-on covering material. 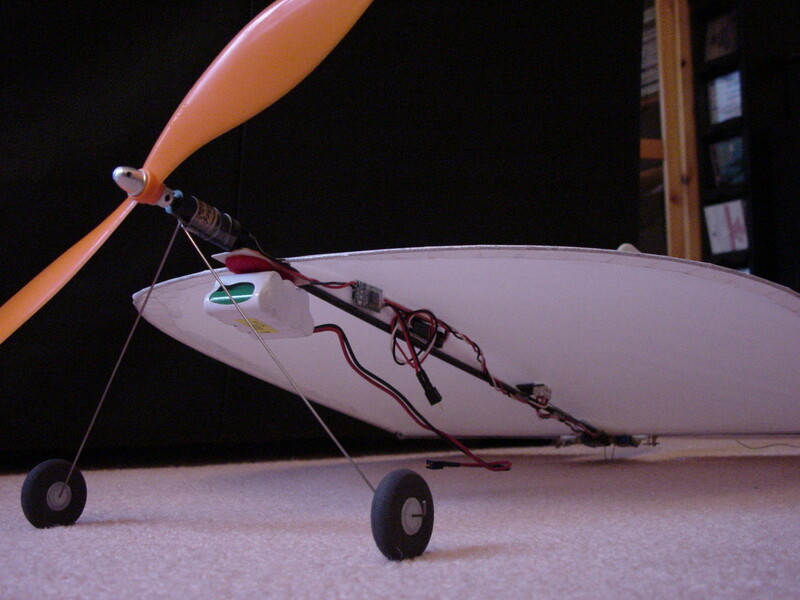 Motor: Astro Firefly, with 16:1 gearbox, Astro speed control, and 10x8 GWS prop (static thrust is about 90g and current 800mA). Battery: 7x70 to 8x300 NiMh. 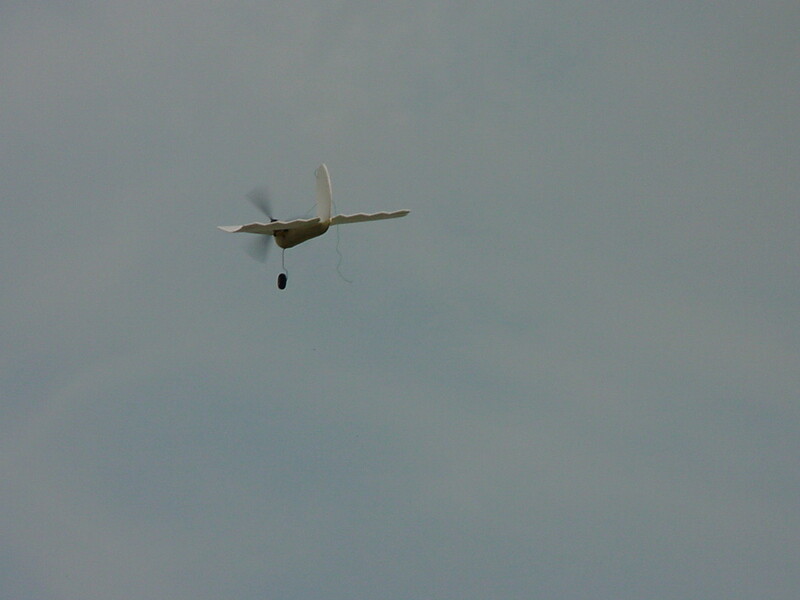 Mass: without battery: 80g; with 8x300 NiMh pack: 145g. 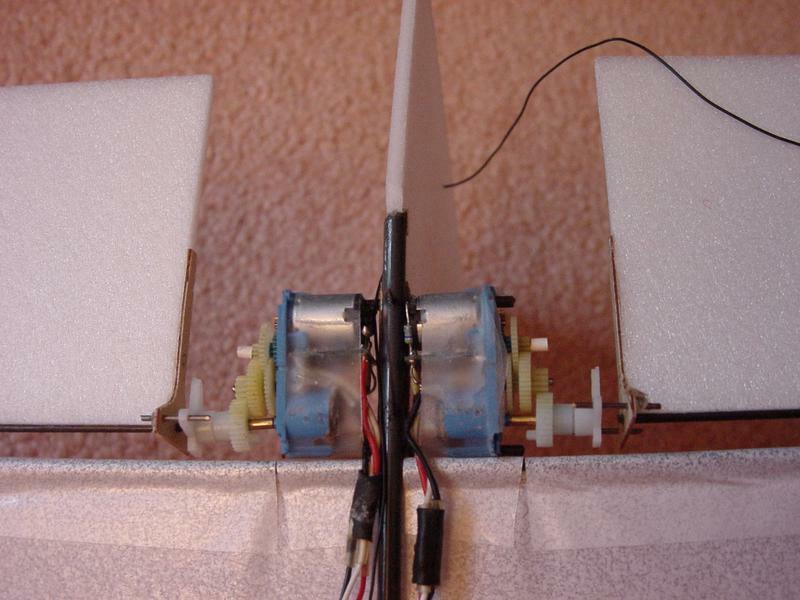 Radio: 2 Volz servos mounted directly on the control surface, RX72 receiver from Sky Hooks and Riggings. 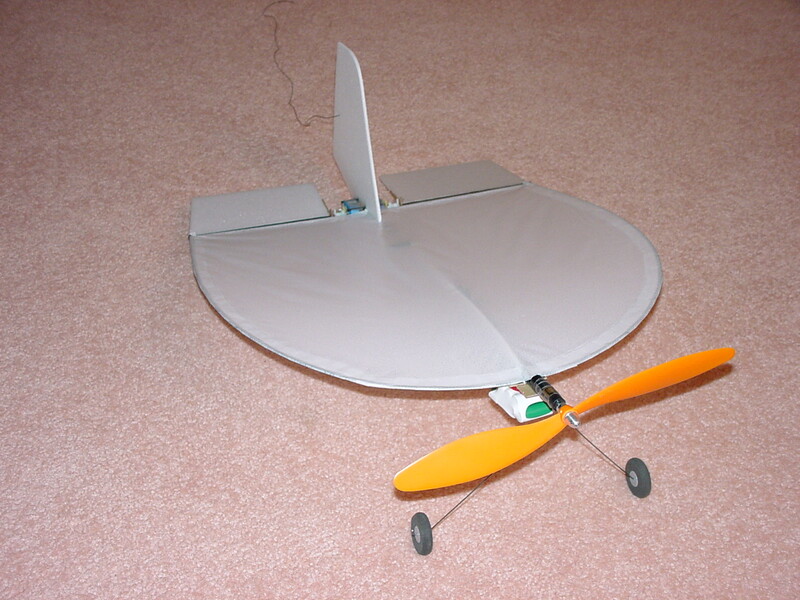 This baby is very light and slow, ideal for indoor flying. With a 7-cell 150mAh battery or an 8-cell 300mAh it's just a tad underpowered or overweight (it flies fine, but there is no big reserve of power). An 8-cell 150mAh NiMh, or even a 7-cell 70mAh NiMh would be ideal, but I haven't tried that yet. 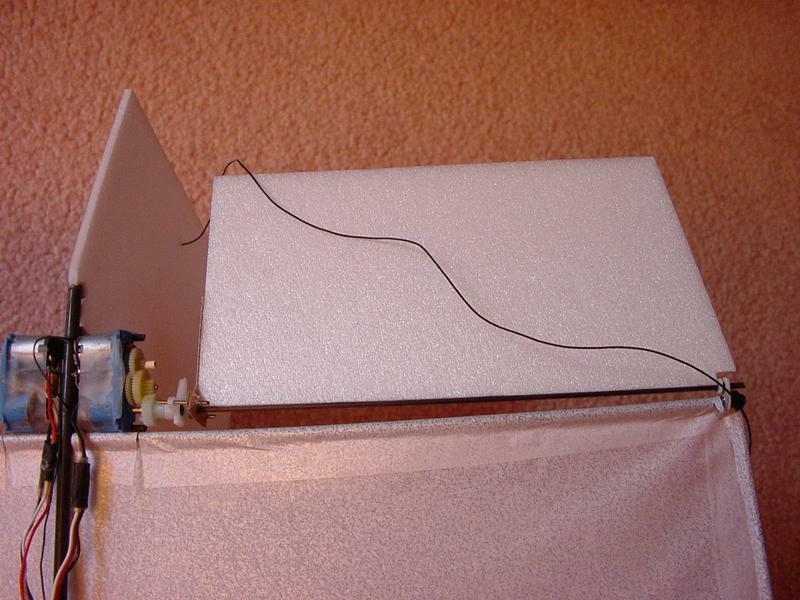 The battery pack hangs with self-sticking velcro pads. It must be placed as far forward as possible to get the correct balance (because the servos are all the way tothe rear). 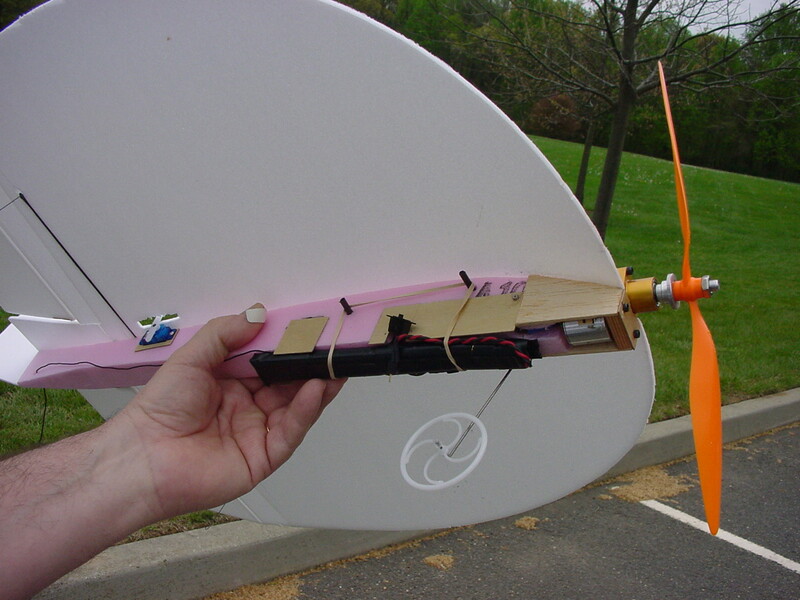 A piece of 6mm Depron holds the shape of the airfoil. This shows the "direct drive" mechanism for the control surfaces. These are Kolibri Volz servos taken out of their soft shell. Any small servo under 6 or 7 grams would do fine. Another detail of the control mechanism. The control surface is a single piece of 3mm depron with a carbon rod used as an axle. 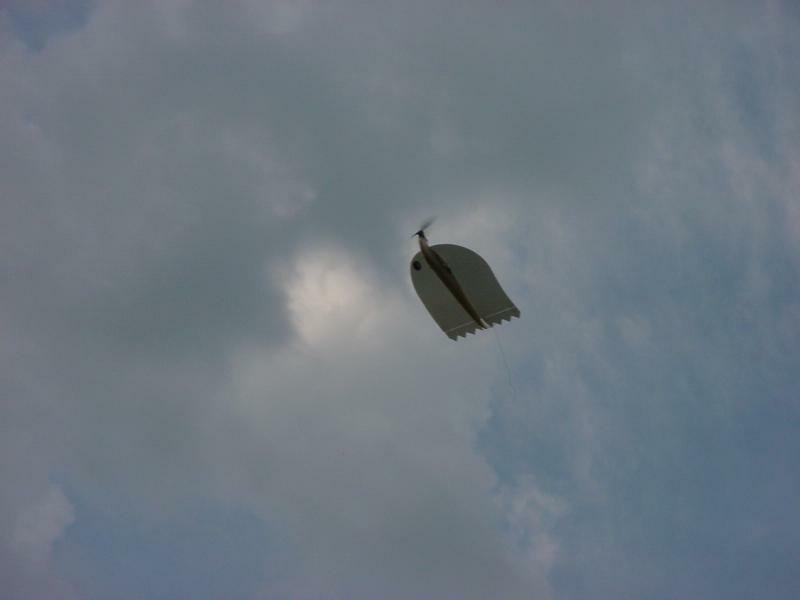 Like its semi-namesake the Flying Dutchman, the Flying PacMan is a ghost. Well, it's shaped like a ghost anyway. It is designed to look like the nasty little ghosts in the video game PacMan. The wing is (not surprisingly) a 3mm sheet of depron glued to a yellow foam fuselage. 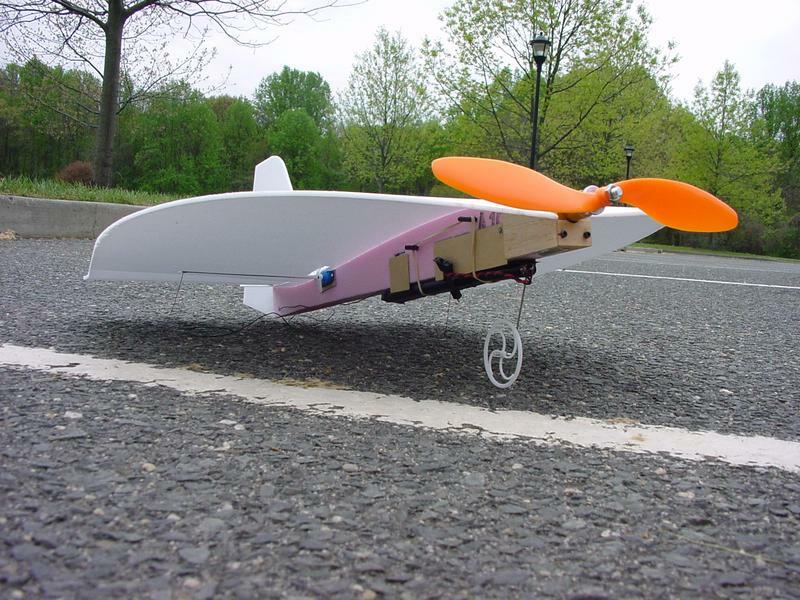 It was originally powered by a Speed-280 with a 4:1 JH gearbox and a 3 blade prop (slowflyer drive stock number JH28043 from Hobby Lobby), with 7 to 8 cell batteries anywhere between 300 and 700mAh NiMh. 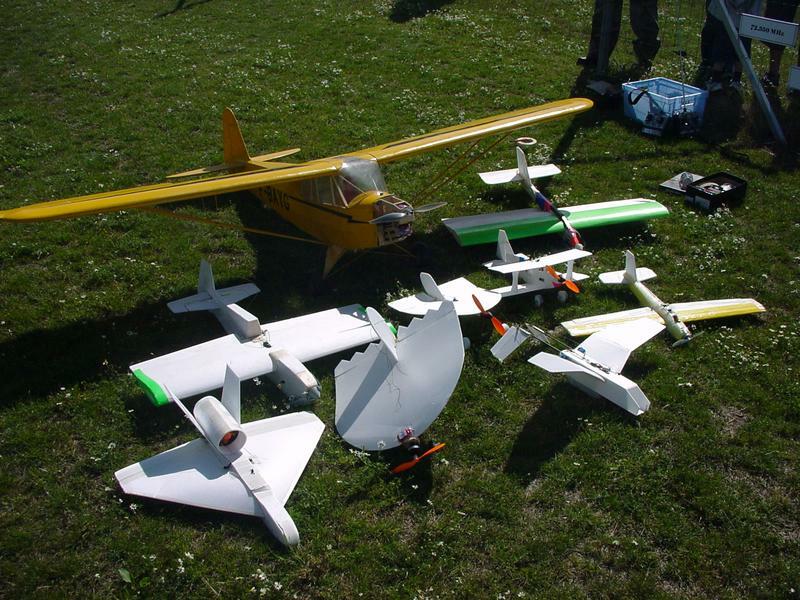 It flies very gently and is an ideal platform to teach kids to fly model airplanes. The plane is now powered by a Nippy 280 brushless outrunner/LRK motor (also obtainable from Hobby Lobby) with a GWS 9047 orange prop. The battery is an 8-cell 700mAh NiMH, but 2-cell 1200 mAh LiPo high dischage LiPo would be even better. This new motorization gives it a lot more power for steep climbs.